A Welsh language religious and general periodical serving the Established Church, mainly in south Wales. The periodical's main contents were religious, literary and antiquarian articles, denominational news, foreign and domestic news, poetry and music. 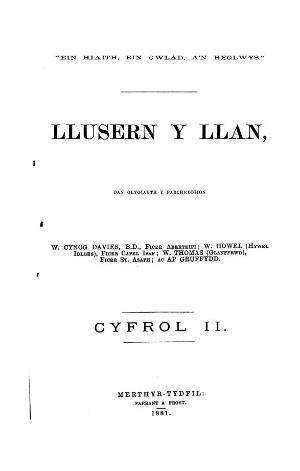 Editorial duties were shared between William Cynog Davies, Evan Thomas Davies (Dyfrig, 1847-1927), William Howells (Hywel Idloes), Jabez Edmund Jenkins (Creidiol, 1840-1903) and William Thomas (Glanffrwd, 1843-1890). Originally a monthly periodical it was published quarterly during 1883.